I thought this was going to be something like Marley and Me. Maybe a little sappy, but a drama about relationships that somehow involved a dog. It was, in fact, a drama about relationships that involved a dog, but was somehow far worse than a movie starring Jennifer Aniston and Owen Wilson. And the only tears shed were not due to a touching story, but over the hundreds of minutes of my life that were wasted while watching this. First of all, Diane Keaton did her usual bit of freaking out every oh, 5 seconds. If you don't know what I'm talking about, just go watch The First Wives Club, Something's Gotta Give, Because I Said So (scratch that last one - it's just not worth it), etc. And I know old people still love her androgynous style from Annie Hall, but is it too much to ask that she ever wear something other than a pantsuit? Besides having a terrible plot, the movie isn't even close to being balanced. If you're going to make a movie about relationships, at least try to make it seem like both halves contribute to its issues. "Marriages don't break up on account of infidelity. It's just a symptom that something else is wrong." [Name that movie! Bonus points if you can quote the following line.] Except in this movie, everything is apparently Kevin Kline's fault. Which isn't to say his character isn't a complete d*ck in the movie - he is. But again, the writers made him that way. Do people like this actually exist? If so, who marries them? Additionally, the first half of the movie felt like it had been edited so much that you spent every 10 minutes wondering WTF is going on?? It had multiple plot lines that were given equal screen time, almost as if it were an ensemble movie. 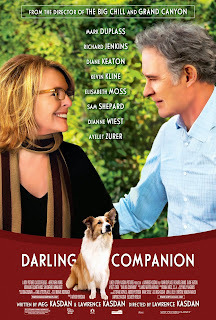 Except that it's not because the movie is supposed to be about Diane Keaton, Kevin Kline, and their dog. It's as if the other story lines are a distraction to fill time because the writers couldn't come up with enough crappy dialogue for Keaton and Kline. And don't get me started on the reasoning behind putting a random gypsy into the storyline. Really? A gypsy? Why? This whole movie just felt very... unfinished. Almost as if a drama student out there wrote this with hitting a certain word count in mind. The middle of the movie drags on and on and on with little action or meaningful dialogue and you have to wonder if they ran out of money to pay for new scenery or if their writers went on strike because absolutely nothing happens. I mean, there actually came a point when the movie switched into rough animation because I guess the director couldn't be bothered to choreograph an action sequence with a dog. I'm shaking my head as I type this because the whole thing was just so tragic. Final word: I'm actually shocked this wasn't a straight-to-DVD release. This somehow garnered 3.5 out of 5 stars on Amazon. Relatives of those involved with the movie must have been coaxed to write reviews. You can buy it and watch it for yourself. Don't say you weren't warned.